Deprecated, use the Messages endpoint instead. 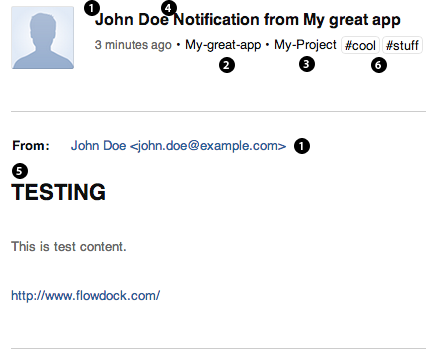 Send mail-like messages to the team inbox of a flow. subject Required Subject line of the message. It will be displayed as the title of the team inbox message. reply_to Email address for replies. It will be used when replying to the message from CA Flowdock. format Format of the message content. The default value is html. Only HTML is currently supported. tags List of tags to be added to the message. Can either be an array (JSON only) or a string with tags delimited with commas. User tags should start with ’@’. Hashtags can optionally be prefixed with “#”. Tags are case insensitive. These are equivalent: ["@Mike", "#cool", "awesome"] and "#awesome,cool,@mike"